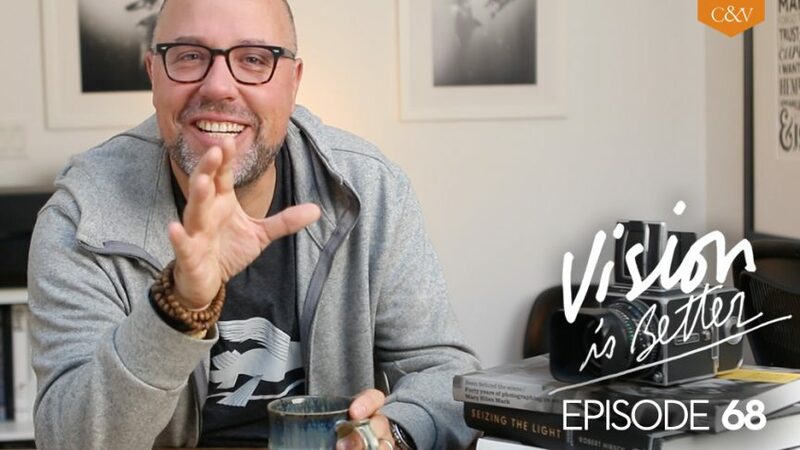 This is an edited transcript of Episode 68 of my show, Vision Is Better, which you can find on YouTube here. If you’d rather listen to it as an mP3 file, you can get that here. We live in a culture that not only hopes but EXPECTS on some level to get noticed, and I don’t think this is necessarily a bad thing. If you do work you believe in, it makes total sense that you’d want that work to find an audience. But that very desire and the pursuit of it, can sabotage our efforts and our hopes. First I want to look at the big picture and see if we can get a little deeper perspective on the subject of finding an audience for our work. In the next post I want to get super practical, and in the final of three I want to tell you my story, how I got where I am – wherever that is – and what I would have done differently. Okay, first, it’s entirely possible that too many photographers are looking to get known for great work before they are really MAKING great work. As a result they aren’t making the great work for which they’d get known. “Getting known” is a by-product. That doesn’t mean you shouldn’t be crazy intentional about it. But it would be unfair if I didn’t begin by suggesting we take Steve Martin’s advice seriously: you’ve got to be so good they can’t ignore you. Of course that’s only part of the story, but it’s the first part and it matters. You might need to forget this whole idea of getting known – for now – and work on your craft. We live in a culture of instant everything and “getting known” has probably never been so important to us. But I think we’re aiming at the wrong thing. You’ve got to aim (first) at doing your best work, not getting known. If you’re looking for fans before you look for critics, it’s a good sign you’ve got an opportunity to get better at what you do. My suggestion: be relentless about seeking criticism. Be open to the idea that your best work is ahead of you. Take advantage of opportunities to have your images reviewed or critiqued by people you respect, people who have skin in the game and have a diversity of experiences. Soak it up. Be more concerned about learning and mastering your craft. The first step to finding an audience for your work is being relentless about making that work as strong as possible, and that will always be your first step. Everyday. For the rest of your life. Or for as long as you pursue this craft. The second thing I’d like to suggest is that we’re asking an incomplete question because when you ask: “How do I get known?” my first question is: known for what? If your reply is, “well, for my photographs, dummy!” then you aren’t digging deep enough. Everyone wants to “get known” as if that means anything on its own. What we’re talking about here is audience and the question we’re asking, reframed, is this: How do I get an audience? That question can only be answered when you know what it is you want to say, because they’re linked. I’m going to be more practical about things in the next article, but for now: ask yourself what you want to be known for – and be as specific as possible. What kind of photographs? What kind of stories or messaging or ideas do you want to put forth? What kind of experience do you want people to have? What do you want to give to the world? Be focused about this. I know we all think we’re the exception, the one person that can just shoot everything so well that focusing our work isn’t important, but it is, and we aren’t. The third idea I think we need to consider is WHY? Why is this even a concern? I’m not asking rhetorically. Unless you know what you’re trying to accomplish, you won’t know how to get there. For me it’s really important that I have an audience, but the size of that audience isn’t important, though – like anyone else – it’s hard not to get discouraged when I compare myself to others. I don’t want a large audience of disengaged people – that’s meaningless to me. And because I know this it helps me determine how I do what I do – for example, I’m strongly opposed to any tactics that would increase my follower count simply to grow the numbers. I could buy my way to a million followers. Much of Instagram already does that. It’s meaningless to me because I do this for the engagement and for the connection and “followers” that aren’t invested won’t engage. I have nothing to contribute to their lives and I’d rather spend the energy on real people and real life. I have no desire to leverage my social media following for sponsorship so I don’t need big inflated numbers. Now, if you do want to do that, then there are ways. But either way, you need to know what you’re trying to accomplish. Fame for fame’s sake doesn’t interest me. Being invited in some small way into the lives of others, helping them do what they love, making their lives richer: that’s meaningful to me. That’s what I want. So know ahead of time if you want numbers for numbers sake or if you want engagement. I’ll take engagement anytime because engagement is how you get impact. Why do I want an audience? To what end? What will having 20K or 1M followers give me that I don’t have now? What opportunities am I really looking for? It’s probably not about the followers but about what having those followers means to you, what it can give you. Am I creating work right now that reflects that? Am I really ready? You have one shot at making a first impression – don’t rush it. Until you think about these three questions nothing I discuss in the next post is going to make a bit of difference. You’re asking me about a destination and how you get there. But unless you’re really specific about that destination then no amount of strategy in the world is going to help. We live in a time when “getting known” whatever that means to you in terms of scale, has never been easier – we have tools that no generation before us – for good or bad – has ever had access to, and with those tools come some incredible opportunities, but those tools will work way better for you if figure out where you want to go and why. And very revealing reflecting on those questions too. whom my work is useful – while I completely LOVING doing birth photography. This is all a thoroughly satisfying thought as I work at becoming technically a better photographer, and also hone in closer for my vision of my “style/story telling” of births. I suppose that why I never care much about using social media that much, I am too invested in the real physical people in front of me. But does that sort of thinking (being with actual people and sort of “ignoring” social media outlets), in this day and age, detract too much from creating actual work? Thank you for that reminder, that there ARE real people behind the avatars. I suppose there is a need for myself to find a good balance between using social media and actual work/photography/being WITH the people I serve – any suggestions or prior thoughts you’ve dished out on this? I love questions more than answers, and yours are right on target. I always enjoy your musings. Thank you. Interesting article, with interesting viewpoints. Looking forward too the next ones. Very, very on point David! For some reason it’s easy to let the game of chasing number on social media become an empty pursuit, so I especially like the idea of “what will 20k or 1m followers do for me that I don’t have now.” It really puts things into perspective and makes you look beyond the numbers. Instead, having the perspective of building a small, engaged audience is much more satisfying and fulfilling. It’s like the “1000 True Fans” idea of Kevin Kelly isn’t it? Thanks David! You nailed it, David. Those are big questions that most of us will spend our lives trying to answer.